Rich and savory, these cheese scones are quite a departure from the sweeter scones we know and love. But these savory cheddar scones made with buttermilk and brushed with smoked paprika butter are the perfect accompaniment to a steaming bowl of soup or crisp salad. So what is the difference between a biscuit and a scone? Opinions vary on this subject, so I’ll just tell you what I think rather than pretending to know a definitive answer. I think that scones should be richer than biscuits. They are a special treat, so I don’t hold back on the butter or cream or whatever else I happen to feel like using. I really didn’t hold back when I was developing this recipe. These scones are butter-rich and filled with delicious aged cheddar and Parmigiano Reggiano. As if that wasn’t enough, I brushed the tops with smoked paprika butter before popping them in the oven. You’re right. That was a good idea. 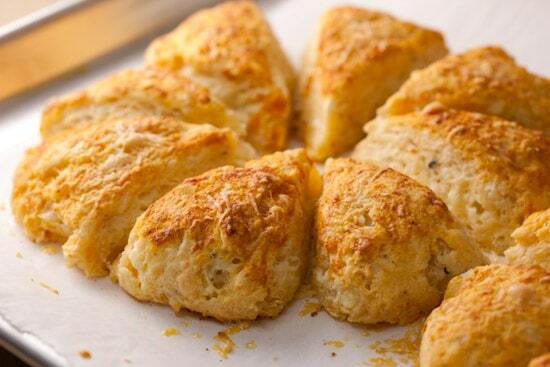 These scones are put together just like biscuits. If you’ve never made biscuits or scones before, you might want to read this post before giving these a try. First, the butter is cut or rubbed into the flour until the mixture looks like a bit like coarse crumbs and the larger pieces of butter are about the size of peas. I like to use my fingertips to rub the butter into the flour, but you can also use a pastry blender or two knives (a food processor also works great if you don’t mind cleaning it). Next, the shredded cheeses are added to the flour mixture and stirred in before the liquid is added. 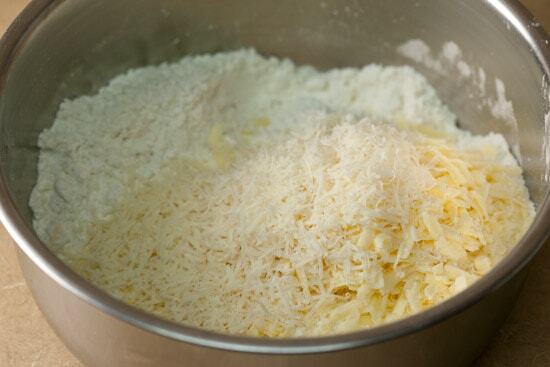 Make sure to reserve a couple tablespoons of shredded parmesan to sprinkle on the scones before baking. 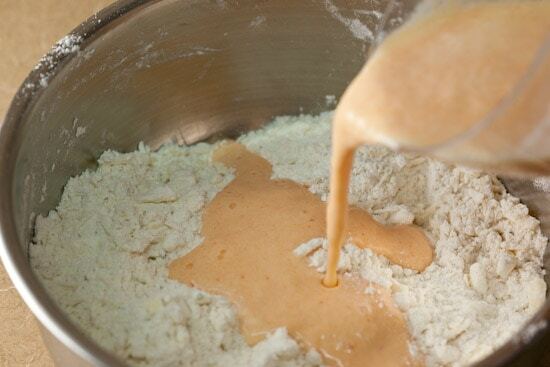 After the cheese has been stirred in, combine the buttermilk, egg, and hot sauce and add it to the dry ingredients. I always use a wooden spoon to mix my dough. Nothing else feels right to me! 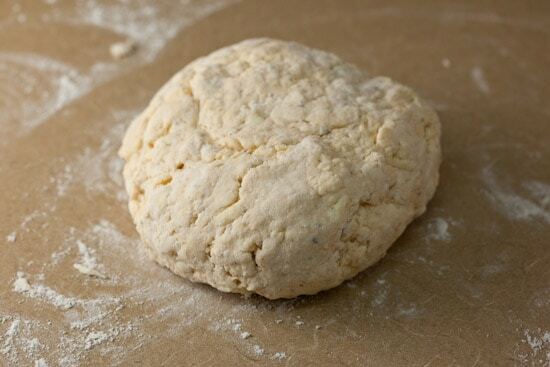 Mix until all the flour has been incorporated and the dough gathers together into a big shaggy ball. 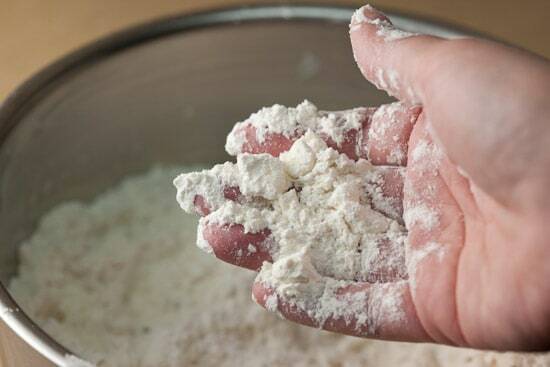 Sprinkle a bit of flour onto your work surface and dump out the dough. Knead it a couple times to bring it all together, but don’t worry about the dough being completely smooth. The key is to work the dough as little as possible. Shape the two pieces into circles, about 1-inch thick. Cut each circle into 8 equal pieces. Move all the scones onto the parchment-lined baking sheet. Mix two tablespoons of melted butter with 1/2 teaspoon smoked paprika. 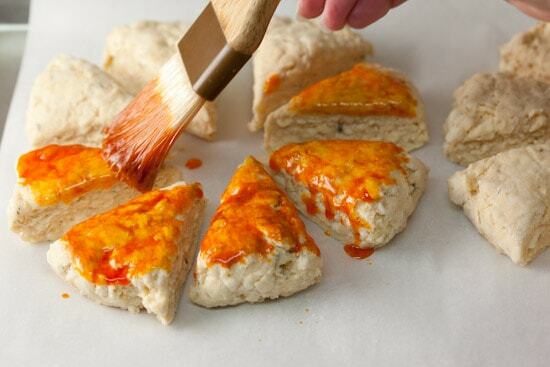 Brush the tops of the unbaked scones with the smoked paprika butter. Sprinkle the tops of the scones with a little bit of shredded parmesan. Bake the scones at 425 degrees for about 15 minutes or until the edges have turned golden brown. Move them to a wire rack to cool for a few minutes before eating. Serve warm or at room temperature. 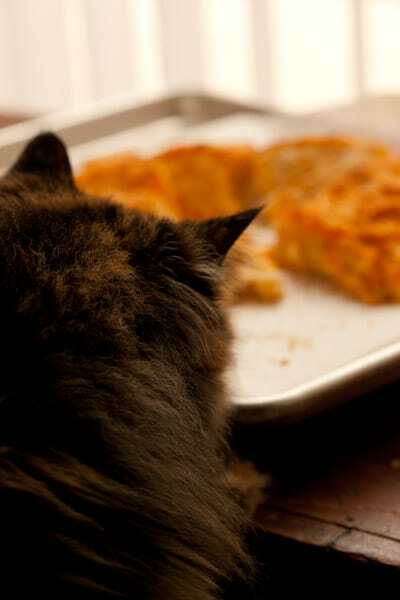 Be careful where you let these cool… my cheddar-loving cat Thumbelina was about to help herself to one of these savory cheese scones when I caught her! I was chosen by McCormick to participate in the McCormick Real Gourmets program. I have been paid by them and I received a big box full of McCormick Gourmet spices. I have been using McCormick Gourmet for years, and am thrilled for the opportunity to explore more of their spices and blends. 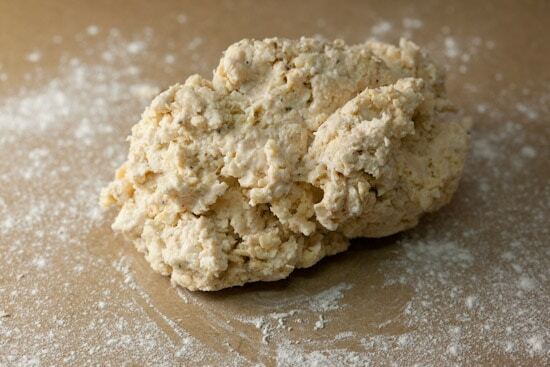 I used the following McCormick Gourmet spices when creating this savory scone recipe: Black Tellicherry Peppercorns, Ground Mustard, and Smoked Paprika. 2. 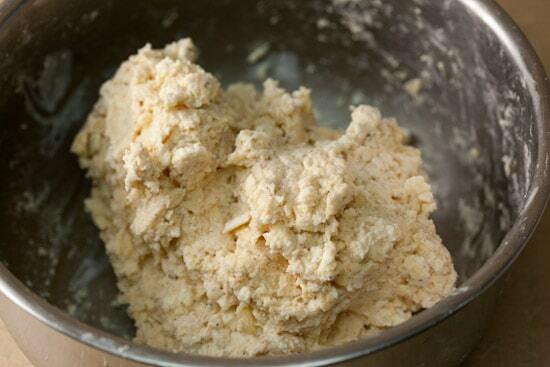 In a large bowl, whisk together flours, baking powder, baking soda, salt, pepper, and ground mustard. Rub butter into the flour mixture using your fingertips (or use a pastry blender or two knives) until the mixture resembles coarse crumbs. Stir in the the shredded cheddar and most of the shredded parmesan (reserve about 2 tablespoons to sprinkle over the tops of the scones). 3. In a medium bowl or large measuring cup, whisk together buttermilk, sriracha, and egg. 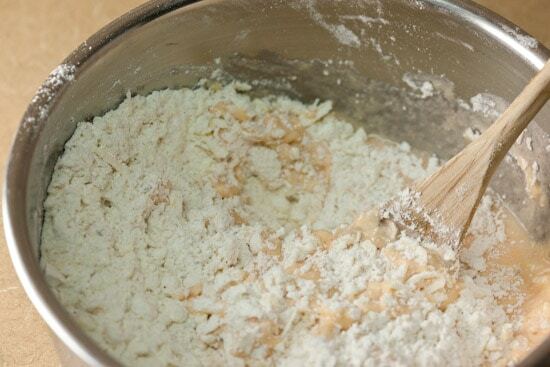 Pour buttermilk mixture into the flour mixture and stir with a wooden spoon just until a ball of dough comes together. 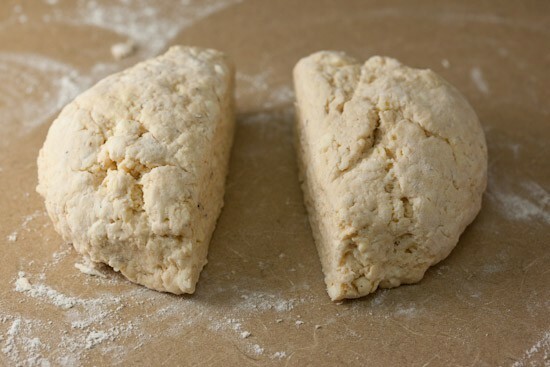 Dump the dough onto a lightly floured surfaced and knead a couple of times (using a bit of flour if the dough is too sticky) just to bring the dough together. 4. 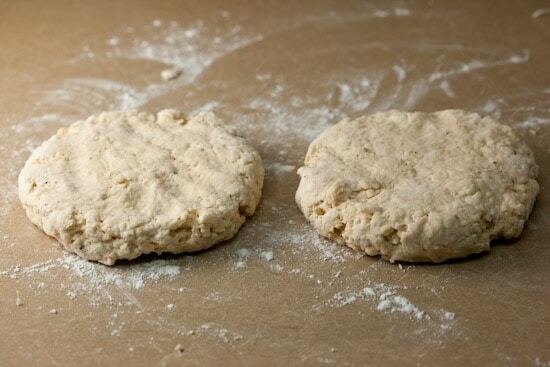 Cut the dough into two equal pieces and flatten each piece into a circle, about 1" thick. 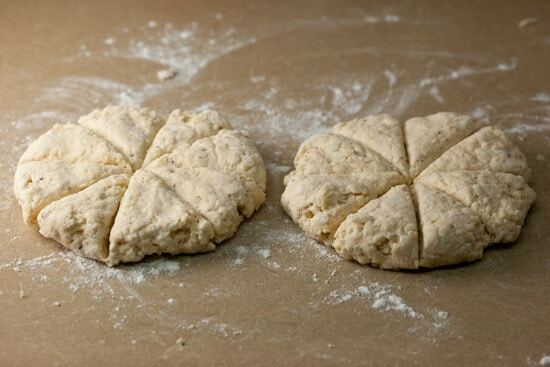 Cut each circle into 8 triangles and move them to a parchment-lined baking sheet. Stir together the melted butter and smoked paprika and lightly brush the butter mixture over the tops of the scones using a pastry brush. Sprinkle the scones with the remaining shredded parmesan cheese. 5. 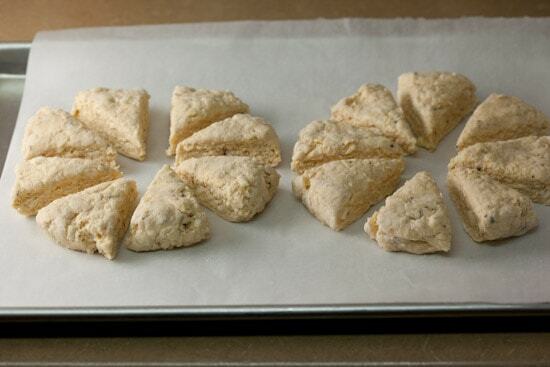 Bake scones in a preheated 425 degree oven for about 15 minutes or until golden brown along the edges. Let cool on a wire rack for 5-10 minutes before eating. Enjoy warm or at room temperature. those scones would be perfect for a Valentine's breakfast... or a brunch! Love that they are savory. I could totally see these replacing corn bread on chili night. Being a self-proclaimed scone officianado, I just want you to know that I totally agree with your assessment of the difference between a scone and a biscuit. These look incredible. I've bookmarked them to make later in the week. The paprika butter is a brilliant idea. YUM YUM~ Those really look flavorful! I will try 'em out! I love how you topped them with smoked paprika! That is so different, I don't think I have ever seen that before. The smokiness with the cheese I'm sure is amazing. 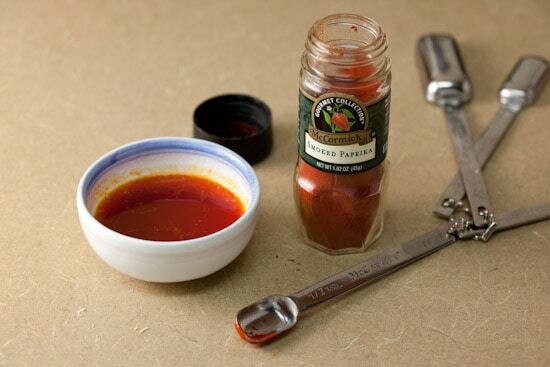 McCormick's Smoked Paprika is very good! I've never seen scones like that. The smoked paprika glaze is genius. Great work. oooh, the glaze is such a great idea! I love cheddar cheese but unfortunately you can't find anywhere here! Your scones are perfect and so yummy!!! It's a very grat idea! I so wish I had some Cheddar in the fridge so that I could duplicate these right now!!!! I keep meaning to make savoury scones / muffins - this looks like just the recipe to get going with it. Love the picture of Thumbelina! Those look spectacular, and I LOVE the step-by-step photos and instruction. The addition of the hot sauce sounds amazing! I really want to make these. These scones look perfect. I prefer them savory, but rarely make them (last time I made the Scallion ones by Farmgirl that you have listed, and that was more then 3 years ago!) Thanks for reminding me how wonderful these little treats are:) . i saw the hand-smashing technique for cutting butter in a Scott Peacock article, and now that's the only way that works for me. cheers! I tried something similar for christmas dinner. 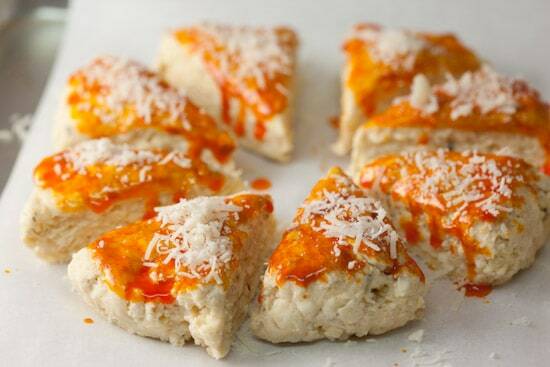 We had cheddar chipotle scones and could not get enough! thanks for sharing the beautiful pics! nicole, once again a great descriptive blog. The pictures are very useful and fantastic. Thank you for the recipe. Looks amazing! I will definately be trying these the next time I have a craving for cheese scones. These look delicious! I have put them on "to make" list. These look amazing. I'll have to give them a try! I'm definitely going to make these for someone special... well, for me - but this recipe looks amazing! I can't wait! Mmmm.... these are great. Mine just came out of the oven and all ready three of them are gone. I love the paprika on top with the cheese and the chili sauce is a great addition. Thanks for the recipe! The smoked paprika butter looks amazing. I have to try that sometime. These scones would be perfect next to the hog I'm about to cook up. I made this tonight and they did not come out as expected. my scones did not cook all the way through. I left them in the oven for 10 extra minutes and the insides still looked like undercooked pizza dough. Do you have any thoughts where i went wrong. Marcia - It sounds like maybe your oven temperature is off. Perhaps you can check it with an oven thermometer? Also, when baking at such a high temperature, it's necessary to let the oven preheat for quite a while. Maybe you didn't preheat it long enough? If the scones were in a 425 degree oven for 25 minutes, I can't imagine that they'd still be doughy inside. Sorry that they didn't turn out for you! Oh my goodness, what a great idea for the topping. I love it! Loved the pictures....especially your "helper". I am snowed in today. What a perfect recipe to try! Thank you. Made these tonight to have with chili--they were delicious & so easy to make. Thanks for the recipe! First, your photos are gorgeous! It must take you forever to bake, because you really do a great job of capturing every step of the process. I'm impressed.Second, congrats on the McCormick's spice gig. We received some jars at BlogHer Food, and I am in love with their new Saigon cinnamon.Finally, I thought I'd pass along my trick. I read it a long time ago in Cooks Illustrated. When you're making scones it works wonders if you use a cheese grater to grate the cold butter into the dish to mix. Works like a charm! I have never had much success with scones. I will definitely try these. They look perfect. Holy mackeral. The cinnamon muffins were yummy looking but these are just amazing. I've always meant to check out your site- now I am castigating myself for having not sooner. And wondering for what occasion I could make these--ASAP. Wow, it looks delicious. You are so smart! Look at that cat, you are so cruel. I have tried that but color is not so beautiful. Do you have more tips? Expect your more blogs. Hi - thanks for this recipe. I just made them this morning and they turned out delicious! I did make one adjustment -- used 1 cup of buttermilk instead of 1/2 cup since the mixture was too dry and not turning into a shaggy ball. Mmmm, I just made these a few minutes ago. Eating one as I type. Great recipe! These look so delicious! 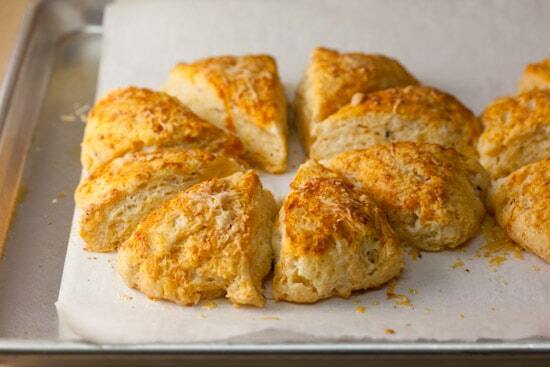 I love savory scones and cheddar biscuits. The addition of the Smoked Paprika butter sounds fantastic! Oh man these look good! Great step by step photos!!! Hi,I just made them for lunch and they were amazing ! It was my first time making scones so they turned out rather misshaped since I was afraid to overwork the dough...but they are so delicious ! I made them without the paprika butter ( never heard of it before) and they still turned out great ! These are fabulous and very easy to make. I made them when some friends came for lunch and they disappeared very quickly! Thank you so much for the recipe. I can't thank you enough for this recipe. For the past month (since you posted your "best of" near the beginning of the year) I've made these at least once a week. We eat them with chili - soooooo yummy. I never have the specified cheeses so I substitute. We've done cheddar and pepper jack and today asiago and sharp cheddar. Mmmmmm! Made these today, but used a round biscuit cutter. SO FLIPPING good!!! Will be sharing photos and of course linking to you next week.Thanks for a great recipe. I have been craving some prosciutto and and cheddar scones and couldn't find a recipe so I tweaked this to match my mouthdemands by omitting the mustard, hot sauce, and paprika and instead went for a dryer scone with about 1/2 a cup of it added instead. I think, now that the craving is completely and utterly given in to, I might have to just make some more with the original recipe this time. Definitely putting it in my recipe binder. Thanks! These look amazing! Can I use all cheddar or substitute mozzarella for the parmesan?